Medicinal properties attributed to Calendula officinalis plant. Benefits of Pot marigold. Uses, warnings about its use (contraindications). Preparation and dosage of Pot marigold. Health benefits. The essential oil of Calendula officinalis is responsible for its antiseptic and parasiticide actions, along with the presence of alcohols and terpene lactones, having an antibiotic and fungicide action. It has anti-inflammatory properties due to the faradiol triterpene alcohol, is wound healing, emmenagogue, antispasmodic, sudorific, choleretic and hypotensive. Because of its properties, the Pot marigold is used internally for the inflammation of organs, intestinal ulcers, constipation, infections and dysmenorrhea. It is also used as a diuretic and diaphoretic. 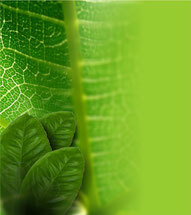 Has been used in cancer therapy, but currently is not been extended their usefulness. 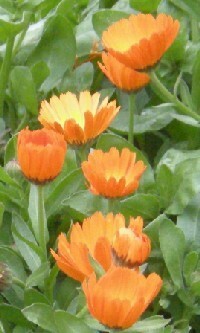 The preparations of the Calendula officinalis have been used for blood circulation, spasms and eczema. It´s also prescribed for irregular menstruation. However the benefits of Pot marigold, currently its use is confined almost exclusively topically: acne, skin rashes, scalds, minor burns, bruises, insect bites, disinfection and healing up wounds, skin ulcers, boils , abscesses, exfoliative dermatitis, gingivitis, pharyngitis, vulvovaginitis, vulvovaginal mucosal dystrophy. 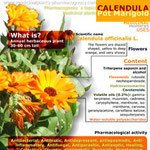 The Calendula officinalis is contraindicated in pregnancy and lactation (in concentrated extractive forms). The fresh plant can cause contact dermatitis although its sensitization potential is low after the frequent use of the drug, demonstrated by the low percentage of involvement in patients studied with 10% tincture. Only 2 patients out of 1031 had reactions (Bruynzee et al, 1992). There is one report of anaphylactic shock after gargling with an infusion of calendula plant (Goldman, 1974). - Infusion of Calendula officinalis: one teaspoon per cup. Infuse 15 minutes, have a cup before meals. To treat dysmenorrhea, must begin to take it fifteen days before menstruation. - Tincture of Pot marigold (1:10): 40-60 drops three times daily. - Fluid Extract (1:1) 20 to 30 drops, twice or three times daily. -Fluid Extract: mix 10 drops in 200 mL of water, apply 3-5 times a day. summary characteristics and properties of Calendula officinalis. summary characteristics and properties of Pot marigold. Ahmed AA et al., Sesquiterpene glycosides from Calendula officinalis. In: JNP 56(10):1821. 1993. Bisset NG, Calendulae floss - marigold, in Herbal Drugsand Phytopharmaceuticals; a Handbook for Practice on a Scientific Basis. Medpharm Scientific Publishers, Stuttgart and CRC Press, Boca Raton, FL, USA, 1994. Bruynzeel DP, Van Ketel WG, Young E et al., Contact sensitization by alternative topical medicaments containing plant extracts. Contact Dermatitis 1992: 27:278-279. Delia Loggia R et al., The role of triterpenoids in the topical antiinflammatory activity of Calendula officinalis flowers. In: PM 60(6):516-520. 1994. De Tommasi N, Conti C, Stein ML, Pizza C, Structure and in vitro antiviral activity of triterpenoid saponins from Calendula arvensis. Planta Med (1991 Jun) 57(3):250-3. Dumenil G, Chemli R & Balansard G et al., Evaluation of antibacterial properties of marigold glowers (Calendula officinalis L.) and mother homeopathic tinctures of C. officinalis L. and G. arvensis L. Ann Pharm Fr 1980; 38(6):493-499. Kloucek-Popova E, Popov A, Pavlova N et al., Influence of the physiological regeneration and epithelization using fractions isolated from Calendula officinalis. Acta Physiol Pharmacol Bulg 1982; 8(4):63-67. Patrick KFM, Kumar S, Edwardson PAD et al., Induction of vascularisation by an aqueous extract of the flowers of Calendula officinalis L the European marigold. Phytomedicine 1996; 3(1): 11-18. Boucaud-Maitre, Y.: Citotoxic antitumoral activity of C. officinallis. Pharmazie 43, 1988. Chispolier, T.: Estudio del efecto antiinflamatorio con un grupo de extractos de plantas. Vet Sciences 18(6), 1981. Dwmenil, G.: Estudio de las propiedades antibacterianas de las flores de caléndula y sus tinturas. Ann Pharm Franc 38, 1980. Elías, R.: Antimutagenic activity of some saponines isolated from C. officinalis, C. arvensis and Hedera helix. Mutagenesis 5(4), 1990. Fuentes, V. R. et al. : El cultivo de una especie medicinal: Calendula officinalis. Rev Plantas Medicinales 6: 25-33, 1986. Goldman, I.: Anaphyllactic shock after garging with an infusión of caléndula. Klim Med 52(4), 1974. Granda, M. et al. : Estudios fenológicos en plantas medicinales. Rev Cubana Farm 20(3):243-251, 1986.